“Most people understand that it’s impossible for a nuclear power plant to literally explode in the sense of an atomic explosion”, an interviewee states. And most people understand that chemical and steam explosions at Chernobyl and Fukushima spread radionuclides over vast distances. The interviewee wants to change the name of nuclear power plants to avoid any conflation between nuclear power and weapons. Evidently he didn’t get the memo that the potential to use nuclear power plants (and related facilities) to produce weapons is fast becoming one of the industry’s key marketing points. The “New Nuclear” lobby is kicking off its New Nuclear propaganda for 2017 with its favourite tactic – FILM. tors, and to endless consumption of electricity. Then came the even more sophisticated and glossier television series, “Twisting the Dragon’s Tail”, a subtle nuclear advertisement promotion that featured Australia quite strongly. Cleverly introducing the negative aspects of the nuclear industry, it finishes with that same message for boundless energy consumption via New Nuclear. These so-called “independent documentaries” are quite lavishly and expensively produced. Who pays for them? That is a well-kept secret. Do presenters like Derek Muller (Dragon’s Tail) understand how they are being used? Thee theme of this 2017 nuclear advertisement will be that “only via new nuclear power can the world be saved from climate change” It will focus on the new smart young people who reject the boring old people’s anxiety about nuclear power. 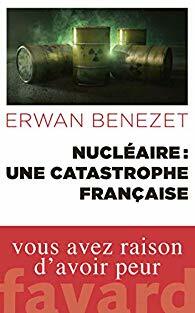 Liberation 12th Nov 2018 The journalist Erwan Benezet publishes “Nuclear: a French catastrophe”. an offensive to obtain the construction of new EPR reactors. nuclear fire”, and decided to demonstrate it in a well-substantiated book. aimed at lifting the thick fog that surrounds the French nuclear complex. It’s not looking likely the blaze will calm any time soon. One of the reasons for the scale of destruction being visited on the state is a collection of environmental triggers brought about by climate change, according to Doctor Daniel Swain of UCLA…….He said due to rising temperatures and dryness similar fires could affect the state for many years to come. The contract could be worth upward of $25 billion over the next decade, with hundreds of millions of dollars more in performance-based bonus fees. Six other corporations will join the team in support roles…….. The current management team, which also includes defense contractor Bechtel, amassed more than $110 million in fines and withheld bonuses because of health and safety issues. An electrical accident in 2015 left a worker hospitalized for over a month, and waste packaging errors led to a drum burst in 2014 at the Waste Isolation Pilot Plant in Carlsbad, exposing workers to radiation. The accident caused the storage facility to shut down for nearly three years……. Sometimes the effects of climate change seem to creep up, as when sea levels rise an inch every few years, or when temperatures break records by a tenth of a degree. But when your backyard is on fire, you feel global warming breathing down your neck. In the last three years, as global temperatures spiked to new records, it sometimes felt like the whole world was ablaze, as a series of “worst-ever” fires damaged and destroyed ecosystems and human communities on nearly every continent, under new climate conditions that will be the norm by 2050. Even if we stopped emitting greenhouse gases today, fire conditions will become even more persistent in areas already at risk, and will spread to new regions as warming drives vegetation patterns and land-use changes. Without rethinking our relationship with nature, landscapes, and wildfire, we are doomed to repeat the mistakes of the past, with the same catastrophic results. The past few years have shown how bad things can get, fire experts say. In the super-heated El Niño years of 2015 and 2016, there were late-summer tundra fires in Greenland, peat fires in Indonesia, and hardwood forests in the southeast United States that burned on an unprecedented scale. By early 2017, El Niño had faded, but parts of the Southern Hemisphere were scorched by record heat and fires, including Australia, where fire experts made statements similar to the bulletins coming out of Southern California right now: “This is the worst day we have seen in the history of New South Wales when it comes to fire danger ratings and fire conditions,” Shane Fitzsimmons, the state’s rural fire chief, told the BBC in February, with almost 100 bushfires burning………..
Scientists have been warning for 20 years that climate change would increase the risk of damaging fires, and that many of these fires can’t be stopped. Communities in less developed countries are most at risk right now. They need more resources to manage landscapes to prevent fires, and they need better weather and climate forecasting services—and the ability to put people and tools on the ground. At times, the growing risk already seems to be outpacing society’s capacity to adapt. In 2016, the GFMC sent a team of experts to South America to warn of fire risks and help communities prepare. Six months later, before any measures were taken, deadly fires burned across parts of Chile and Argentina following a record heat wave. Alexander Held, a resilience expert at the European Forest Institute, says that hubris is the biggest problem in the face of a growing fire threat. “It’s all coming down to failed land management and that our societies have forgotten how to live with fire,” Held tells Pacific Standard via email. Held advocates shifting resources from fire suppression to fire prevention, including managed fires, which are scientifically proven to be the best way to minimize catastrophic effects on communities and natural resources. According to Thursday’s summary from Calfire, a total of 6,900 homes, businesses, and other structures were destroyed across northern and southern California. The fires have burned over 245,000 acres of land, bringing the total area burned in California this year to 1.1 million acres, the most since 2008. Nationally, 8.8 million acres have burned in 2017, says the National Interagency Fire Center, putting this year in fifth place for largest annual area burned since 1960. With over two months to go in the year, 2017 is likely to move up several places on that list. Fall Film Festival includes Documentary on St. Louis Nuclear Waste Site and Landfill Fire, Huntington News, July 23, 2017 BY TONY RUTHERFORD , HNN ENTERTAINMENT EDITOR “……….The Fall International Film Festival includes a not yet shown HBO documentary, “Atomic Homefront,” which details the anguish of confronting state and federal agencies over nuclear waste dumping in St. Louis. The film is by Sarah Spurlock, wife of Morgan Spurlock. Left unsaid, both the NY Times , Wall Street Journal, and HNN have revealed that Huntington , too, had a uranium and nickel carbonyl plant that processed and recycled fuels for three gaseous diffusion plants. When the process was found to not be cost effective, the structure — owned by the Atomic Energy Commission — was dismantled and the most contaminated portions buried in Piketon,Ohio. Workers from the Huntington Pilot Plant have received compensation from the Dept. of Labor for working in a facility covered under the Atomic Energy Commission definition that includes the St. Louis site, Oak Ridge, Paducah, and Piketon, Ohio. f you’re not screaming mad by the end of Atomic Homefront, you obviously believe the systemworks. As a study in government failure and corporate greed, this HBO-supported documentary from director Rebecca Cammisa shows that your trust is grievously and tragically misplaced if you expect the Environmental Protection Agency to serve a desperate public. Likewise, if you believe a large waste service company would provide honest guidance and responsibility in serving its customers, think again. Donald Trump gives right-wing investment banker Breitbart News firebrand a top security role! Bannon Is Given Security Role Usually Held for Generals By GLENN THRUSH and MAGGIE HABERMANNYT, JAN. 29, 2017 WASHINGTON — The whirlwind first week of Donald J. Trump’s presidency had all the bravura hallmarks of a Stephen K. Bannon production. In theory, the move put Mr. Bannon, a former Navy surface warfare officer, admiral’s aide, investment banker, Hollywood producer and Breitbart News firebrand, on the same level as his friend, Michael T. Flynn, the national security adviser, a former Pentagon intelligence chief who was Mr. Trump’s top adviser on national security issues before a series of missteps reduced his influence.But in terms of real influence, Mr. Bannon looms above almost everyone except the president’s son-in-law, Jared Kushner, in the Trumpian pecking order, according to interviews with two dozen Trump insiders and current and former national security officials. The move involving Mr. Bannon, as well as the boost in status to the White House homeland security adviser, Thomas P. Bossert, and Mr. Trump’s relationships with cabinet appointees like Defense Secretary Jim Mattis, have essentially layered over Mr. Flynn. Critics blast Cuomo’s $7.6B subsidy for nuclear plants, WBFO.org, By KAREN DEWITT, 8 Dec 16, A long-term energy plan by the Cuomo administration that includes a nearly $8 billion subsidy to two upstate nuclear power plants is being challenged from both ends of the political spectrum, and a lawsuit has been filed to try to stop the deal. Gov. Andrew Cuomo’s Public Service Commission plans to convert 50 percent of the state’s power sources to renewable energy over the next decade and a half. A controversial part of that program includes a $7.6 billion state-financed subsidy to a company that now runs two New York nuclear power plants ­– Nine Mile Point in Oswego and Ginna near Rochester – and is taking over a third plant, FitzPatrick, also in Oswego. Other progressive-leaning groups, including the New York Public Interest Research Group, also object to the deal. “In some ways, it’s a straight-up ratepayer issue,” said Blair Horner, NYPIRG’s legislative director. He said the deal will result in $2.3 billion in increased payments for residential utility customers, and even more for businesses. That’s in a state that already has among the highest utility rates in the nation. The US NRC report says that this “explosion in the protected area” which was “due to equipment failure” occurred at 0840 AM on Tuesday November 8th: “The explosion was to the 138 kV power cross connect cable between the Unit 2 and 3 Station Auxiliary Transformers.” If you look at the above image, all of the power lines appear very cramped at this nuclear power station, apparently increasing the dangers. Ambitious Dutch climate plan includes shutdown of new coal-fired plants, CBC radio AS It Happaens 29 Sep 16 The Netherlands has voted to adopt some of Europe’s most drastic measures to cut carbon emissions. In a close vote last week, the Dutch parliament pledged a 55 per cent cut in cut C02 by 2030. That would include a shutdown of the country’s five remaining coal power plants, including three that opened just last year.